To start the Mapping, go to the second step of the Syncee Import wizard, which is titled "Field Mapping". 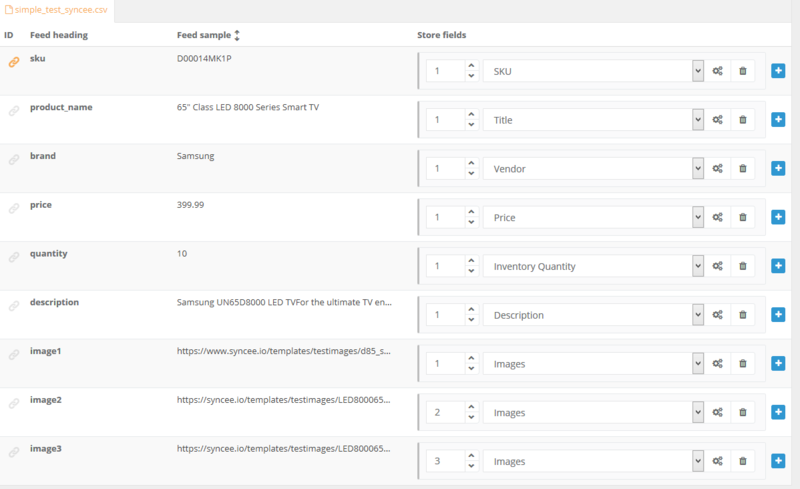 In the first section, you will need to connect the headers of your source file with the adequate Store fields, that equals with the name of the fields in your Shopify store when you add a new product. Your source file need to have a field that contains the product's Title and Price in order to proceed. On the left hand-side, under the ID, you can see a chain icon, which is very important because Syncee uses that setting to handle variants. In order to do that, it is required to mark one Feed Heading, that we can use to identify variants. Wholesalers usually refer to this as "product ID, group ID or product reference". On the right side of the page, if you click on the plus sign, you can add more than one Store fields to your Feed heading, for example, Option value1, (Color) and a Tag. If you would like to edit the details of a field, click on the small gear-wheels. We will talk about these settings in other articles in more detail. If you would like to delete the added Store field, click on the trash can icon. You can use one Store field more than once, it is especially useful in the case of Tags or Variants. If you do this, set number "1" at the beginning of the Store Field line to "2" or to a bigger number, depends on how many times you have used that field. Don't worry if you forgot this step, Syncee will automatically change the numbers starting the counting from the top of the page. If you would like to know more about the following sections on this page, read our articles about Mapping Settings and Update Options.